In an effort to combat the issue of hunger in the region, I have joined several area organizations in creating a Hunger Garden in the city of Uniontown. An official ribbon-cutting and ceremonial planting will take place Thursday, May 24, from 4:30-7 p.m. Though many of us may not realize the grave disparities that exist in our own communities, people struggle with hunger in every county and legislative district in Pennsylvania. They could be our neighbors, kids in our children's classes – the possibilities go on. In Pennsylvania, nearly 1.7 million people are struggling with hunger, and of them, 482,130 are children. That means one in every eight people struggle with hunger. Perhaps more strikingly, that is one in every six children are hungry. Right here in Fayette County, 20,650 individuals qualified as food insecure. In 2017, that is 15.3 percent of our population according to Feeding America’s Map the Meal Gap 2017: Overall Food Insecurities in Pennsylvania by County. I have partnered with the Redstone Foundation, Fayette Chamber of Commerce, Fayette County Community Action Agency, the Master Gardeners at the Penn State Extension and other community organizations to bring attention to the hunger issue in Fayette County by building a Hunger Garden. 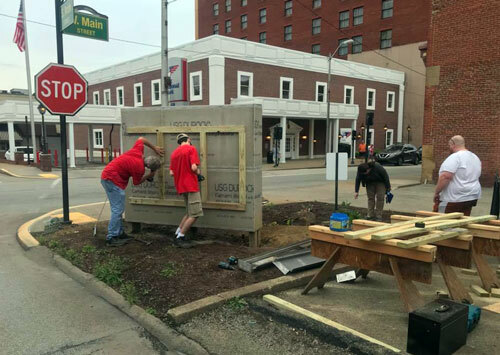 This includes renovation of planters on the corners of Main Street and South Arch Street and West South Street and South Arch Street in Uniontown. These renovated planters are designed and to be built by Life Scout Jonathan Buckel of Saint Mary’s Troop 620, who is working to attain the rank of Eagle Scout. Muriel Nuttall, executive director and secretary of the Fayette Chamber of Commerce and the Redstone Foundation, said this event is a collaboration of many fine agencies and persons. The Fayette County Food Bank, operated by Fayette Community Action Agency, is one of the community partners that will benefit from of the harvest and subsequent activities. Executive Director Jim Stark said this is truly a community effort. Area businesses and organizations are being asked to consider organizing a food drive collection or creative way to help support the local food banks. Donations from the food collections can be dropped off at the event. Those interested in information regarding the Hunger Garden should contact Amanda Cuteri at my district office at 724-438-6100 or email at acuteri@pahousegop.com.